Original plaque unveiled 21 May 1994. Subsequently removed when the fire engine house was rebuilt. “I am pleased to welcome you to this small ceremony to record the unveiling of the plaque behind me. I am especially delighted to welcome Mrs. Knight, who is the granddaughter of the first fire chief of Caterham, Robert Vigar, and other members of the family*. Robert Vigar held the position until his death in 1923. There is a description of him and his many skills in Local History Records in 1984 written by Jean Tooke, who is also here today. I can imagine there was a similar gathering when the fire engine house was opened 105 years ago in 1889. When one considers that Caterham had been expanding in leaps and bounds from the time the railway came to the town in 1856, they seem to have been a little tardy in appreciating the need for a fire service here on the Hill. The subject was first raised in vestry meetings in 1881 and I can well believe that Robert Vigar was a leading light in campaigning for the service. 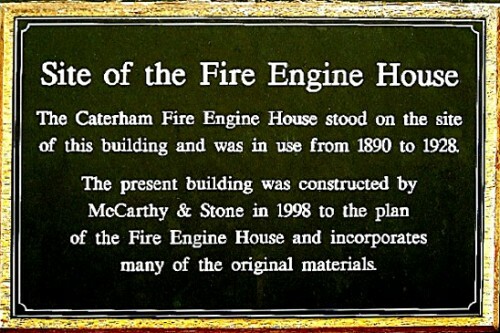 However, be that as it may, the Caterham Fire Brigade was formed in 1889 and a Merryweather Manual Fire Engine was installed in this building. This engine was in use for 40 years. It was horse-drawn and 12 voluntary firemen were on call. The firemen were paid a retaining fee of 24s per annum and had to wait 22 years for a rise. The land on which the house is built was leased from the school board for one shilling (5p) per annum. The first fire escape was kept in a corrugated iron hut on Timber Hill. In 1900 a second fire escape was authorized. This one was housed here as can be clearly seen in old photographs. Telephones were connected between the Hill and Valley and alarm bells installed in firemen’s homes. This worked well at night but during the day firemen had to be summoned from work by call boys. Henrietta Vigar would be dispatched to the fields to catch the two nearest horses, regardless of owners. There exists a report describing how the Hill Brigade reached a fire in the valley in 10 minutes – the result of disciplined drilling by Robert Vigar. The plaque was then unveiled by Roger Packham, then the assembled party inspected the interior of the building and pondered on the life of firemen in the days of yore before retiring to the warmth of the Hon. Sec’s, home to drink a toast to the continued existence of the fire engine house, to present a bouquet to Mrs. Knight, and to dry out. * The Vigar family were represented at the ceremony by four generations: 85 year old Mrs. Bell Knight (Robert Vigar’s granddaughter); David Knight, his great grandson; Joyce Knight (wife of great grandson, John); great great granddaughter Janet Downs, and 5 month old Joshua Downs – Robert Vigar’s great-great-great grandson. 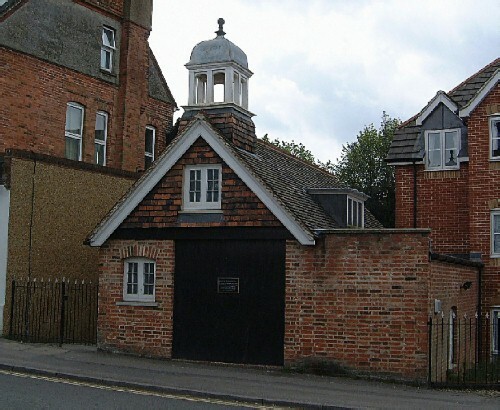 The original fire engine house was in use between 1890 and 1928. In 1998 the site was redeveloped, and the fire engine house demolished. A replica was built by the developers, McCarthy & Stone, incorporating some of the original materials. 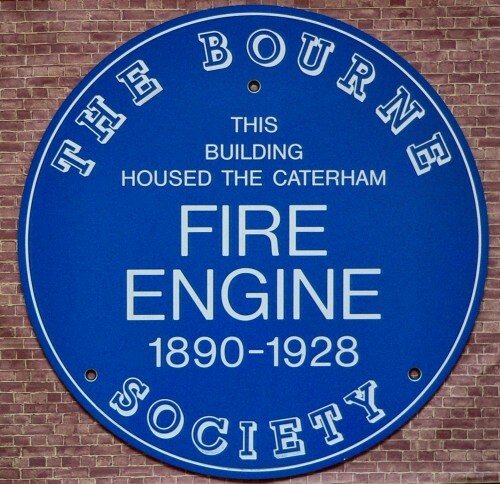 Since the building is no longer original, the Bourne Society plaque was not retained, but a new plaque by the developers was substituted.